Arctander, P., C. Johansen, and M.-A. Coutellec-Vreto. 1999. 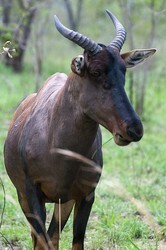 Phylogeography of three closely related African bovids (Tribe Alcelaphini). Molecular Biology and Evolution 16:1724-1739. Essop, M. F., E. H. Harley, and I. Baumgarten. 1997. A molecular phylogeny of some Bovidae based on restriction-site mapping of mitochondrial DNA. Journal of Mammalogy 78:377-386. Grobler, J. P. and F. H. Van Der Bank. 1995. Allozyme divergence among four representatives of the subfamily Alcelaphinae (family: Bovidae). Comparative Biochemistry and Physiology B Biochemisty and Molecular Biology 112:303-308. Matthee, C. A. and T. J. Robinson. 1999. Cytochrome b phylogeny of the family bovidae: resolution within the Alcelaphini, Antilopini, Neotragini, and Tragelaphini. Molecular Phylogenetics and Evolution 12:31-46. Pitra, C., R. A. Kock, R. R. Hofmann, and D. Lieckfeldt. 1998. 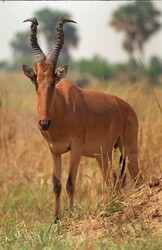 Molecular phylogeny of the critically endandered Hunter's antelope (Beatragus hunteri Sclater 1889). Journal of Zoology and Evolutionary Research 36:179-184. Vrba, E. S. 1979. Phylogenetic analysis and classification of fossil and recent Alcelaphini Mammalia: Bovidae. Biological Journal of the Linnean Society 11:207-228. Page: Tree of Life Alcelaphinae. 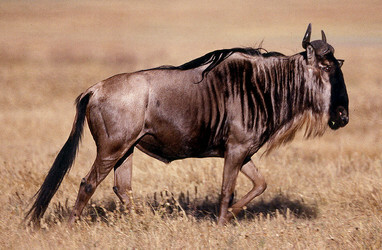 hartebeests, wildebeests, and sassabies. The TEXT of this page is licensed under the Creative Commons Attribution-NonCommercial License - Version 3.0. Note that images and other media featured on this page are each governed by their own license, and they may or may not be available for reuse. Click on an image or a media link to access the media data window, which provides the relevant licensing information. For the general terms and conditions of ToL material reuse and redistribution, please see the Tree of Life Copyright Policies.